This article is about the actor. For the producer, see Sam Jaffe (producer). Shalom "Sam" Jaffe (March 10, 1891 – March 24, 1984) was an American actor, teacher, musician, and engineer. In 1951, he was nominated for the Academy Award for Best Supporting Actor for his performance in The Asphalt Jungle (1950) and appeared in other classic films such as Ben-Hur (1959) and The Day the Earth Stood Still (1951). He is also remembered for other outstanding performances such as the title role in Gunga Din (1939) and the High Lama in Lost Horizon (1937). Jaffe was born to Russian Jewish parents Heida (Ada) and Barnett Jaffe in New York City, New York. His mother was a Yiddish actress in Odessa, Ukraine, prior to moving to the United States; his father was a jeweler. He was the youngest of four children; his siblings were Abraham, Sophie, and Annie. As a child, he appeared in Yiddish theater productions with his mother, who after moving to the United States became a prominent actress and vaudeville star. He graduated from Townsend Harris High School and studied engineering at City College of New York, graduating in 1912. He later attended Columbia University for graduate studies. He also worked for several years as a teacher, and then dean, of mathematics at the Bronx Cultural Institute, a college preparatory school, before returning to acting in 1915. As a young man, he lived in Greenwich Village in the same apartment building as a young John Huston. The two men became good friends and remained so for life. Jaffe was later to star in two of Huston's films: The Asphalt Jungle and The Barbarian and the Geisha. Jaffe's closest friends included Zero Mostel, Edward G. Robinson, Ray Bradbury, and Igor Stravinsky. In 1923 he appeared in the Broadway premiere of God of Vengeance (Got fun Nekome) by Sholem Asch, as Reb Ali. The production became notorious after the cast, producer, and theatre owner were indicted and found guilty on charges of indecency in May 1923. He began to work in film in 1934, rising to prominence with his very first role as the mad Tsar Peter III in The Scarlet Empress. In 1938, Jaffe was forty-seven years old when he played the title role of water "boy" Gunga Din. Jaffe was blacklisted by the Hollywood movie studio bosses during the 1950s, supposedly for being a communist sympathizer. Despite this, he was hired first by Robert Wise for The Day the Earth Stood Still and then by director William Wyler for his role in the 1959 Academy Award-winning version of Ben-Hur. Jaffe co-starred in the ABC television series, Ben Casey as Dr. David Zorba from 1961 to 1965 alongside Vince Edwards. He also made many guest-starring roles on other series, including Batman as Mr. Zoltan Zorba, and the Western Alias Smith and Jones. In 1975, he co-starred as a retired doctor who is murdered by Janet Leigh in the Columbo episode "Forgotten Lady". He also appeared with an all-star cast in the TV pilot film of Rod Serling's Night Gallery and as Emperor Norton in one episode of Bonanza. Jaffe was married to American operatic soprano and musical comedy star Lillian Taiz from 1926 until her death from cancer in 1941. In 1956, he married actress Bettye Ackerman, with whom he later co-starred in Ben Casey. She died on November 20, 2006. He had no children from either marriage. A Democrat, Jaffe supported the campaign of Adlai Stevenson during the 1952 presidential election. Jaffe died of cancer in Beverly Hills, California two weeks after his 93rd birthday. He was cremated at the Pasadena Crematory in Altadena, California, and his ashes were given to his surviving wife, Bettye, which were later buried with her at Williston Cemetery Williston in Williston, South Carolina, upon her death in 2006. Film still of the special TV presentation The Sad and Lonely Sundays (1976). 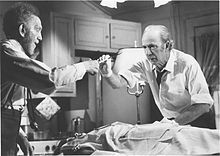 Pictured are Jaffe (left) and Jack Albertson. ^ a b c Flint, Peter B. (25 March 1984). "Sam Jaffe, A Character Actor On Stage and Film, Dies at 93". The New York Times. ^ ""The God of Vengeance": Is the Play Immoral?". 19 June 2012. ^ De Vito, John; Tropea, Frank (2009). Epic Television Miniseries: A Critical History. McFarland. p. 179. ISBN 9780786457335.